The Vent-Axia HR200WK is a heat recovery ventilation unit specifically designed for use in domestic kitchens and utility rooms to meet the Building Regulations. The unit is also suitable for light commercial applications up to 220m3/h (61l/s). 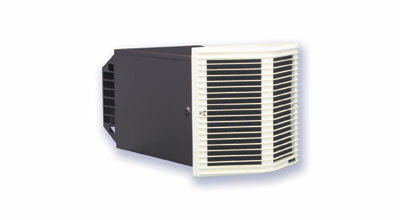 The compact, self contained unit is designed for through-the-wall mounting. The three speed, external rotor motor has two matched impellers to ensure a controlled airflow through the unit, with exceptionally economical 25Watt low speed power consumption. The HR200WK fits through walls up to 335mm thick requiring a fixing hole 250mm square. The internal grille has washable, polymeric foam supply and extract filters. Only the neat internal twin grille is visible from the room. A wall extension sleeve is available for walls up to 550mm thick. The highly efficient, polymeric heat exchanger cube is washable. The compact cube interleaves outgoing moist warm air with incoming fresh air and allows the heat from one to warm the other without the two air streams mixing. Up to 75% of the heat, which would otherwise be lost, is transferred to the intake air, ensuring energy saving ventilation. HR200WK 220-240V/1/50Hz Class 1 earthed appliance. The 3 speed motor, can be wired to operate On/Off for any one of the three speeds. Alternatively, an Ambient Response Humidity Sensor or simple changeover switch can be used to provide switching between any two speeds, giving permanent trickle ventilation and automatic changeover to a higher speed during periods of high moisture generation. Also the 3 speed controller enables the unit to be switched from permanent trickle to either medium or boost speed. The HR200WK fits through walls up to 335mm thick requiring a fixing hole 250mm square. The internal grille has washable, polymeric foam supply and extract filters. Only the neat internal twin grille visible from the room. A wall extension sleeve is available. Apart from removing odours, providing fresh air and recovering heat, this appliance extracts airborne impurities such as dust, dirt and grease. These gradually build up and detract from the efficiency and appearance of the appliance. Therefore to ensure peak performance, the appliance should be cleaned regularly. Filters should be replaced every six months or as conditions necessitate. Quick release grilles give instant access to the integral washable filters. The heat exchanger and grille should be washed in warm soapy water every twelve months or as conditions necessitate. Lower air-flows mean this unit is ideally suitable for residential applications such as care homes and student accommodation. Main body colour; Dark Grey. 3 speed motor, trickle ventilation mode, optional range of switches available.